Please see Services on our car key assist website. Have you lost your Honda car keys and need a reliable automotive locksmith to help? Car Key Assist are the answer! Lost Your Honda Car Key and Need A Replacement or Spare? We supply cut a range of Honda car keys, offering unbeatable vehicle locksmith services across the West Midlands. 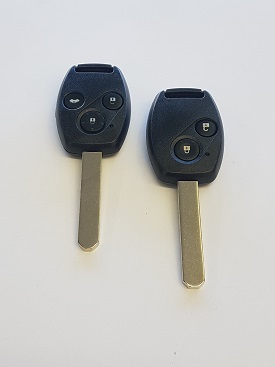 We can supply, cut and programme a variety of Honda key remotes - including Accord, CR-V, CR-Z, FR-V, Jazz, S2000, Seat, Altea, Ibiza, Toledo, Alhambra and Mii. Our expert car key cutting and replacement services are available 24 hours a day, 7 days a week, helping customers get back on the road across Birmingham and the West Midlands. As well as cutting replacement Honda keys to existing locks, we can also open locked Honda vehicles, erase keys from an immobiliser and remove broken keys from ignitions and door locks. All of our are trained to the highest standard to provide the highest quality vehicle locksmith service - available across the Midlands, Shropshire, Staffordshire, Herefordshire, Worcestershire and Warwickshire. Do you have key codes? Have you lost all your keys? Do you have a WORKING spare key? Do you need a spare key? For all other locks, please visit our other website C&T Locksmiths. If your make of vehicle isn't listed, don't worry, please call 0121 783 0442 for more details.